I love fashion as much as you do, but honestly, who has the time, money, or energy anymore? I’m trying to like to do stuff with my life that matters and stuff, okay? But! The fabrics. The colors. The textures. The effect…I’m hooked on my love-hate relationship with fashion. Hand-wash this, hang that, tuck that, buy this, fix that…ugh. I just want it to be simple…and stylish. That’s why I’m always in search of ways to hack my way to better fashion. Here’s a list of my favorite, tried and true ways to be super stylish while saving time, money, and energy. Because seriously, it’s 2016: WE CAN HAVE IT ALL! 1. Excess dye in jeans? Remove it! When your new jeans start leaving blue stains everywhere, grab the vinegar. Well, turn them inside out, rinse them in cold a few times, and then grab a cup of vinegar and soak the jeans overnight. Full steps available here. 2. Buttoned shirt too big? Upcycle it! Simply unbutton the shirt and tie the bottom for this much more fashion-forward look. 3. Zipper stuck? No problem! Just rub Vaseline, a graphite pencil tip, or crayon wax over the jam and slide as usual. 4. Favorite thrift finds plagued by a musty smell? Do this! Spritz the frugal find a mixture of one part vodka (any kind) and two parts water. 5. Want to preserve those new tights? Get the Hairspray! Give the tights a nice light shower with Hairspray when you buy them. 6. Pants too long and no time for a tailor? No worries! Grab some iron-on tape. Seriously. It’ll work wonders in a pinch. 7. Pants feeling too tight these days? Help is here! Keep them out of the dryer! Let them air dry instead and, if needed, stretch the waist by hand while they’re still slightly damp. 8. Spilled liquid makeup on your shirt? Grab some shaving cream! It’s everything you need to dissolve the stain. 9. Clothes stiff? Soften them with salt! Simply brine your stiff clothes in salt for that adored softer feel. A few days will do. 10. Need to break in a leather jacket? Wear it in the rain. 11. Wearing something low cut? DIY a better bra. 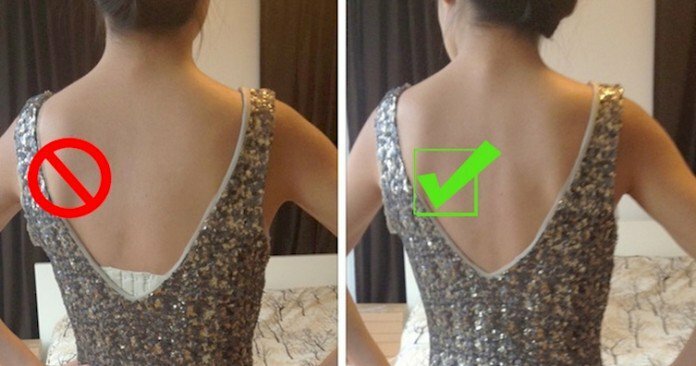 It takes a little work, but is well worth the money saved from buying a brand new bra! Check it out here. It’s all in the fold. Flip it inside out, then follow these steps. 13. Got stains? Grab some sanitizer! It’s a boss at stain removal. Rub it in, wash it out! 14. Sweater pilling? Grab a pumice! Much better than a razor! 15. Jeans smell? Toss them in the freezer. Waste no water or time ever again!